After whining online about no coffee in our office today, I was suprised by a co-worker handing out VIA packets. This is not a commercial for starbucks in any way. I am just going to say that, DAMN did I ever need that. I haven't slept well all week long, and it has showed this morning. No I have a delicious cup of joe in my hands, and I am very pleased. I also tried some of those x-massy flavored ( I am linking this, because everyone should try it) creamers from the store. I have Egg Nog creamer. It is also very nice. No way will I finish it before dec though. Very sweet. I also noticed that my habit of post-it noting everything that I come across has nearly controled my workspace in the office. This needs to stop, and soon! Today begins a new day for Raleigh! 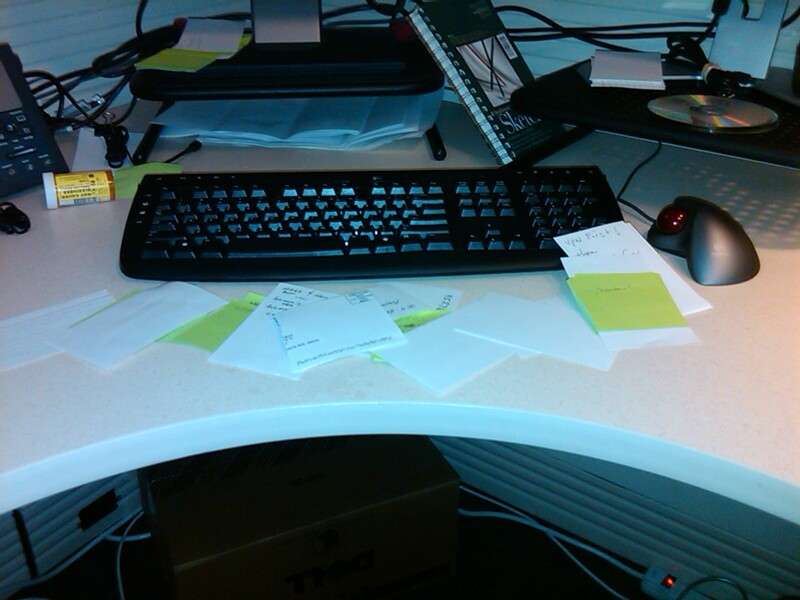 Today will be the day I clean up my desk!